Terra Meridiana is proud to have been selected as the exclusive agency to look after the sale of Villa Mozart, a new-build, luxury contemporary villa in Sierra Blanca, Marbella. Villa Mozart is a landmark new project, designed and built by Ark Architects of Sotogrande, for a three-storey property with rooftop terrace and two swimming pools, all standing on a large, south-facing plot, with stunning views of the Mediterranean Sea. With 1,265m2 of living space and more than 600m2 of open and covered terrace space, Villa Mozart offers a wealth of light-filled accommodation, including a dramatic hallway, with twin staircases and lift, leading to a palatial open-plan sitting room, which opens on to the covered terrace surrounding the ground floor. Also on the entrance level is a 65m2, ultra-modern, open-plan kitchen, with latest generation appliances and informal dining area, leading to a vast dining terrace; a second reception room, which is ideal for use as a TV room or office; two double bedrooms with en-suite bathrooms and dressing rooms; and a guest cloakroom. The first floor features the breathtaking master bedroom suite, with his-and-hers dressing room, a luxurious bathroom with free-standing bathtub, and an incredible private terrace with a glass ceiling that looks up into the rooftop swimming pool. On the same level are two additional bedrooms, both with dressing areas and private bathrooms. The basement has been envisioned as the entertainment hub of the home, with a huge gym and games room, wine cellar, sauna and steam room, home cinema, separate apartment for staff, and a garage with space for up to four vehicles. Outdoors, there is a large heated swimming pool, surrounded by sun terraces, a jacuzzi, and swim-up bar and dining area in the pool, while the rooftop level features a second pool, and extensive solarium. Villa Mozart will be set in full landscaped, sub-tropical gardens, designed to ensure privacy and guarantee views. 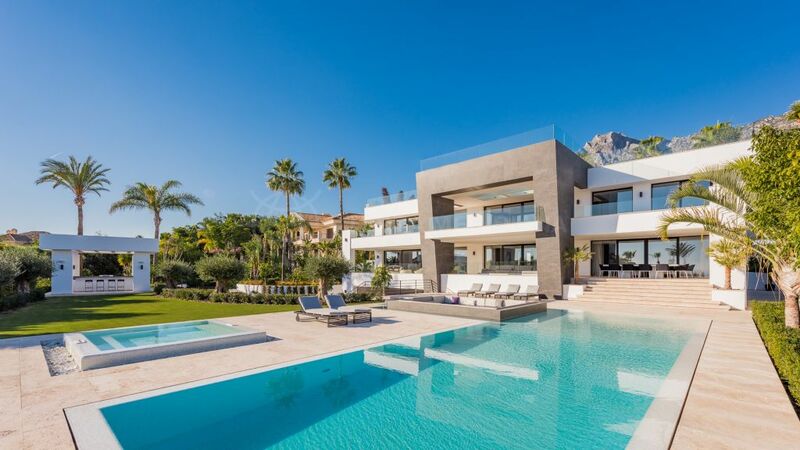 Located in the sought-after area of Sierra Blanca, just minutes from the centre of Marbella, Villa Mozart benefits from 24-hour security in a gated community, and aspires to set new standards in modern luxury living, when completed at the end of 2016. At Terra Meridiana, we believe Villa Mozart will be suited to clients who demand the very best, both in terms of design and details, and who are looking to live in a quiet residential area that is conveniently close to local services and the town centre of Marbella.